TORONTO — Mitchell Gale made sure the Toronto Argonauts christened BMO Field with a win Saturday night. 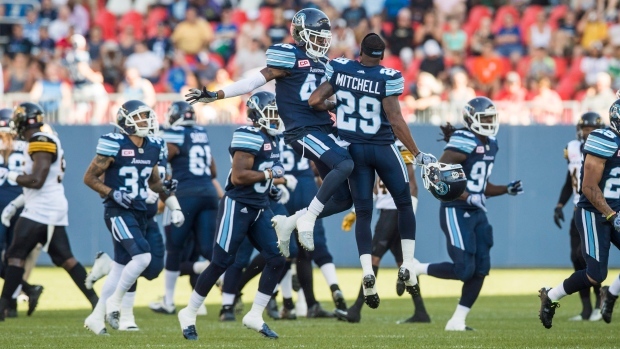 Gale hit Wallace Miles on a five-yard TD strike with under three minutes remaining to earn the Argos a 25-16 exhibition victory over the Hamilton Tiger-Cats in the first game at their new home. The stadium was roughly half full — the attendance wasn't announced — but there still was something present that was often sorely lacking at Rogers Centre, Toronto's former home: atmosphere. Rogers Centre had a capacity exceeding 52,000 for football — 53,208 watched Toronto win the 100th Grey Cup there in 2012 — but the Argos struggled to attract spectators over 27 seasons there. Their attendance last year dropped to 12,431 after averaging 17,791 in 2014 and fans often complained about the proximity of the field and lack of ambience at the domed facility. The football capacity at BMO Field — owned by the City of Toronto and operated by MLSE, the owners of Major League Soccer's Toronto FC — is about 28,000. The outdoor stadium certainly felt cosy and a noticeably younger crowd was very much engaged, even for an exhibition game. "You could just kind of feel, I don't know what it was, just the atmosphere," said veteran quarterback Ricky Ray, entering his fifth season in Toronto. "Our fans are going to enjoy the experience when they're down here. "For us players, it's having our fans a little bit closer. You can definitely hear the noise." And a select few participated in Toronto's tailgate party in nearby parking lots. It will be limited to about 250 vehicles, and while beer and other beverages will be sold, bringing booze from home won't be allowed due to Ontario's strict liquor laws. Gale, who appeared in one game last year with Hamilton, played just one day after rejoining the Argos and was the fourth quarterback used after Logan Kilgore, Ray and rookie Cody Fajardo. Toronto appeared to cement the win earlier in the fourth on Thomas Gordon's interception return TD but it was nullified by an offside penalty. Toronto head coach Scott Milanovich said it was important for his team to establish a winning culture at BMO Field, which he believes can give the Argos a decided home advantage. "Winning is a habit and you always want to win," Milanovich said. "I told them at halftime I don't care who's in or how many reps they've ever had . . . we've got to find a way to win. "Even walking back and forth from the field there's fans and kids lining up and high-fiving our players. It's a different vibe, there's no question about it." But BMO Field will present Toronto and its opponents with challenges. Milanovich believes wind will be a factor given the facility's close proximity to Lake Ontario. And then there's the end zones, which not only consist of artificial turf — BMO Field's playing surface is natural grass — but are 18 yards deep, two short of regulation. "That's going to be a big difference," Ray said. "We've practised it a little bit throughout camp and it's already been a bit of a factor for us with some of the back-end line plays." "A play you might've run from the 10-yard line last year you might have to be on the 12-yard line to run," he said. "We're practising with them (18-yard end zones) and we're getting a decent feel for what we can and can't get away with. "Hopefully that's something we get a feel for and other teams don't." Hamilton and Toronto have decisions to make as CFL teams must cut down to 65 players by Tuesday. Clubs will make their final cuts to the league-mandated 46-man roster limit by Sunday. Hamilton and Toronto play their final exhibition games Friday. The Ticats host Ottawa while the Argos visit Montreal. The Argos and Ticats will kick off the 2016 regular season June 23 at BMO Field. "It's going to be crazy, man, crazy," said defensive lineman Bryan Hall, a former Ticat. "This felt to me like it was the first regular-season game because a lot of people came out showing us love. "Stability is the key for every team. In Hamilton, once we got the stability (with opening of Tim Hortons Field in 2014) and knew where we were going to be at, it took off. I can't see why that can't happen here or exceed expectations." Vidal Hazelton had Toronto's other touchdown. Lirim Hajrullah booted a field goal and convert while Zack Medeiros kicked two field goals and a convert. The other points came on a safety. Tiquan Underwood scored Hamilton's touchdown. Brett Maher added two field goals and a convert while Cody Mandell kicked a field goal.